Think about it. How many social network accounts do you have? 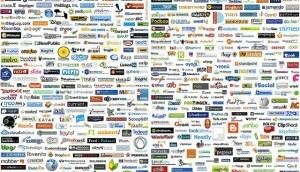 In how many of these networks are you active? Let’s be more specific, when you update your status and/or post links/photos, how many platforms do you use for the same content? Now take a look at the people that you follow (or are your friends). How many people do you have on Facebook, who are also on Twitter, Google+, and so on? Do you get the same updates from them in different platforms? You don’t really need to go far to understand the concept of the Sharepocalypse, do you? Here are some pertinent numbers. Facebook users share 4 billion items every day. That includes status updates, links, photos, and so on. This number is projected to reach 32 billion by 2014. Mind blowing, to say the least! The average numbers: 401 Facebook friends; 235 followed on Twitter; and 187 followers on Twitter. Where do you rank? Twitter gives you more links – 8 times than Facebook. The question is this: where do you get more clicks? This information – and more – is visualized in an infographic created by Summify, as shown below. I particularly like the mention of the “threat of unproductivity”. However, I believe that it is more than a threat at this point. Again, one does not have to look far for supporting evidence. Just think about how often you see your workmates on Facebook, Twitter, etc. during work hours. Now tell me again about unproductivity being a threat! Some say the Sharepocalypse is here. Some say it is to come. How are you dealing with too much online social activity?